My little 104-page book is receiving an elegant new cover courtesy of Jeff Macauley—a graphic designer and cabaret artist here in New York City. To say I am happy is an understatement: I'm thrilled! While covers are one thing, content is another—and in this case, the reader will find my introduction to Klein's succinct and timeless instruction: instruction that is founded in the teachings of the father of voice science. 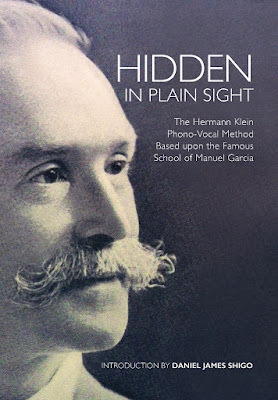 And therein lies the most interesting thing: Klein is unique in presenting the great master's teaching, especially as voice placement is concerned since García did not address the matter in his own writings. I should mention that this cover has a particular meaning for me—a private one—which I am not adverse to divulge. You see, Pauline Viardot-García, who appears in the text, was wont to wear black and purple/lavender silk dresses when she taught. Her brother considered Viardot-García the genius of the family, and it is through her student Anna Schoen-René, who in turn taught Margaret Harshaw, that this book was found in the first place. Without the Viardot-García purple/lavender connection, you wouldn't be reading this post and blog. I hope you will take as much pleasure in reading Klein's text as I did in bring it to you. It's the real deal.